FAST FREE SHIPPING! Ships next business day. Strong Steel and Aluminum frame. One-Step quick release Posi-Lock latch. Extra large 18 x 9 Base for bulky loads. The Super Brute 900 hand truck is one of our customers favorite. 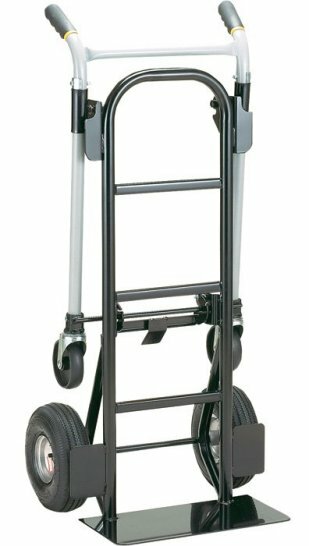 The heavy duty hand truck with its large 10" pneumatic tires made quick work of heavy loads over rough or smooth terrain. 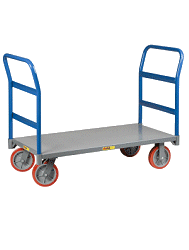 The large wheels assist in moving cargo over uneven, loose, and bumpy surfaces. In the platform position take advantage of the Super Brute's 900 load capacity. This hand truck is made to handle moving heavy items. Use the platform position to carry multiple items with ease. Move items with confidence and order your Super Brute 900 today! HEAVY DUTY BOLTS ON CASTERS. LARGE CAPACITY TRUCK IDEALLY SUITED FOR STOCKING REQUIREMENTS. PLATFORM DIMENSION 13 X 42". WHEEL GUARDS TO PROTECT LOADS. 10" PNEUMATIC WHEELS HEAVY DUTY MEGA WHEELS WITH STEEL HUB TO HELP YOU OVER ALL ROUGH TERRAINS. GREAT FOR USES AROUND THE HOME AND YARD. THIS HAND TRUCK SHIPS THE NEXT BUSINESS DAY! PLATFORM DIMENSION: 13.5" X 42"
This is a fantastic piece of equipment and it operates just like it is stated to do. This hand truck is extremely versatile. It can handle heavy loads standing up or as a lengthy flat bed, and is easy to maneuver with off road tires. Solid and well built hand truck that is multifunctional. It has been a life saver. I purchased this hand truck, because I was moving many things from my house garage, to my new barn..I knew there was no way, I could carry all these heavy items, so I thought I would make use of this hand truck...and OMG...!! It has been a blessing..From two wheels, and then convert to a 4wheeled cart...Just a fantastic piece of equipment .. I couldn't have possibly done without it..Now that most of the move, has been completed...I still use it all the time ... This is a Must Have...When I have completed my work, it hangs on the wall of my new barn, & takes up almost...NO space at all..This truck, is a Godsend ..!!! A must have for the office! My boss commissioned me to buy a good hand truck. I picked this one because of how it doubles as a cart. He didn't like the idea but for the price he thought it looked as though it was well built. When we received it, I just received 4 boxes of copy paper. I loaded it on the hand truck as normal to show him how unsafe it was to move 4 heavy boxes at a time. I then pulled it into the cart took seconds. I loaded them on and easily pulled them. He since uses it more than I do to haul many boxes at a time. This was a great purchase, high quality and inexpensive! I purchased this for my department to move tires and it is a godsend!!! We absolutely love this Made in America hand truck!!! I highly recommend this hand truck to anyone for just about anything!!! And the PRICE was unbelievable after searching other websites. Great hand truck easy to use for a woman. Love that it can be used in two different ways. Would definitely recommend it to anyone who wants a sturdy reliable hand truck. I am very happy with the hand truck! 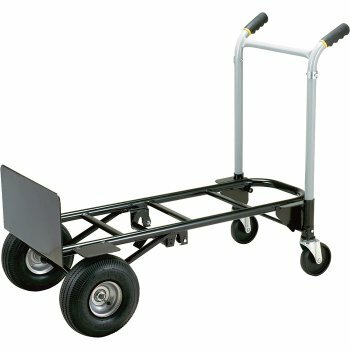 Use this cart to carry heavy sound equipment! Very durable and gets the job done! Used it to load a 1 bedroom apartment into a rental truck, and unloaded into another. The hand truck is great, exactly as advertised and worth every penny. Great product. Well made and designed. Will buy again from your company. Absolutely the best hand truck I've ever owned. I am 100% satisfied with the product as well as with the service I received. Beefy, sturdy and very easy to use. Works just like we were hoping it would. This seems to be a good product. We are using it for a move that is coming up. Product works as advertised. A real backsaver! Product is very good, would recomend it to anyone. We were borrowing a Hand Truck just like this one to go to various craft fairs. My husband said it would be great for around the house also, so we bought him one for his Birthday! He was thrilled. Only problem was, it does not come in a box so he saw it before his Birthday when the delivery person rolled it up the driveway. My daughter works for UPS and forgot they weren't wrapped in any way LOL. Great Truck , came really fast ! I love this hand truck. It's a great height for me in it's upright position since I'm short. It really is heavy duty and has been very useful around our office. Great hand truck with the extended bed in the four wheel configuration. made in AMERICA...hooray delivered quickly, very happy! Strong, reliable, everything that was advertised. If I need another handtruck, I will definately be back.